⚡ See how we can thrive… without destroying the planet — an introduction to Kate Raworth’s Doughnut Economics. It’s easy to feel totally downhearted when thinking about the Earth’s future. Climate change can feel inevitable, particularly when countries like the US are going in completely the wrong direction. The major force driving us towards ecological disaster is simple — it’s our current economic model. Our governments focus on growth — with GDP being the agreed measure — and everything else is secondary. If there’s a choice between protecting the environment and growth, growth always wins. The problem with this mode of thinking is that it ignores the Earth’s natural limits — the cap created by the finite nature of our natural resources. Growth is possible due to exploitation of natural resources… and those resources are not infinite. This goal of infinite growth isn’t just unrealistic — it’s destructive. The logical conclusion is that we need an alternative economic goal — if infinite growth will lead to ecological destruction, we need to aim for something else. 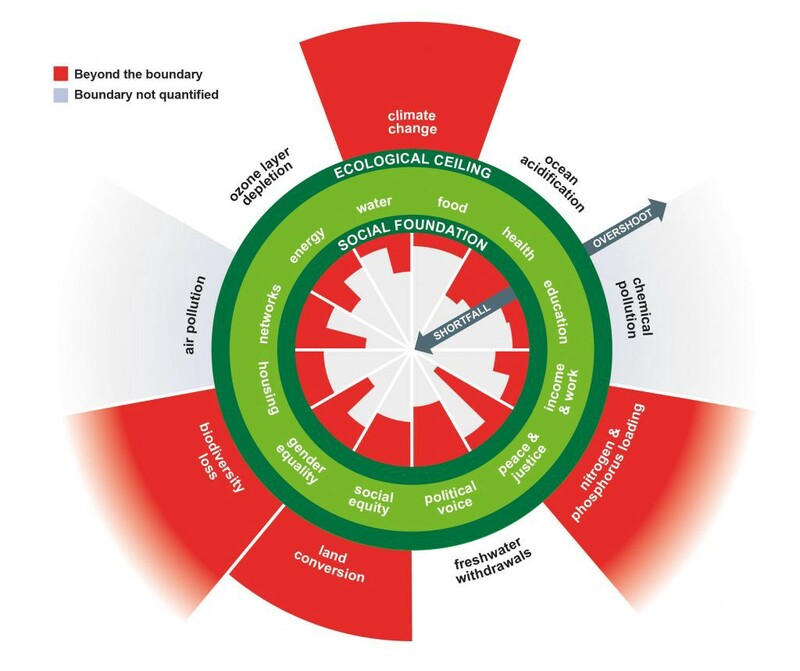 The Doughnut Model, devised by Kate Raworth (who George Monbiot describes as “the John Maynard Keynes of the 21st century”) of Oxford University’s Environmental Change Institute, is that alternative. The Doughnut Model presents the Earth’s natural limits as a ring. Another ring represents a sufficient quantity of the resources that we need to lead a good life. The new economic goal is to stay between those two rings. A visual representation of Doughnut Economics, with the green area representing sufficiency. People don’t have enough food, healthcare or education? Then we’re failing at Doughnut Economics. Our environment is experiencing significant loss of biodiversity? Then we’re failing at Doughnut Economics. Although we’re currently failing in a multitude of different ways (every red section on the image above represents an excess / deficiency in one area), the model itself provides some hope that things can actually change. Presenting a real alternative to growth economics, it has the potential to remove a huge barrier to dealing with our environmental problems. Ideas are, of course, nothing without action. To read more about the specifics of how our economic policy should change, check out Kate Raworth’s Guardian article from earlier this year. For the day-to-day specifics of how to make industry sustainable, check out my efficiency vs. effectiveness in the Circular Economy article and this video on the Circular Economy. For more on the environment, check out the Find A Spark environment homepage.